A brilliantly conceived, expertly executed head that offers a compelling balance of portability and volume for classic rock and blues gigs. Range of tones. Plenty of power. Great looks. No gigbag included. Vulnerable knobs. The classic Vox hallmarks are mingled with extra headroom and power. Both the head and the cab are suitably retro in style. Tight reduces bottom-end respomse and resonance. Plenty of speaker options, plus there's a quality cable included. Everybody says something. "Nice toaster!" shouts a neighbour as we carry the Night Train to the Music Radar charabanc. "Awesome cheese grater," quips a designer on a sister magazine as we arrive at the office. The food jokes aren't entirely off the mark as it goes, because this is the next evolution in lunchbox amps; the bigger, more powerful brother to the Vox NT15. "There's enough gain to satisfy most styles; a thick, harmonic drive that stays on the classic rock side." So, why bigger? "We wanted to give customers a truly versatile and gigworthy amp," begins Vox product development manager, Dave Clarke, "while adding the most requested features not included in the original Night Train, namely a footswitchable Thick mode, a higher gain channel and an effects loop." So, has Vox succeeded? 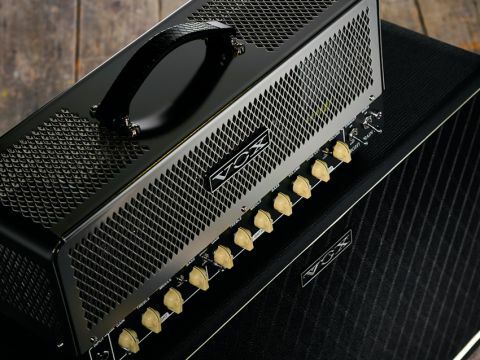 The NT50's front end is based around a two-channel/three-mode design that spans clean tones through to heavy gains. Gain and EQ controls are independent, so there are no compromises when setting the two main sounds, while the footswitchable Thick switch bypasses the EQ section (effectively running it all flat- out) for a heavier-gained sound. Using the VFS2A switch, you have three sounds at your feet. The master section comprises a master volume and Vox's customary Tone Cut pot which, as Clark explains, "works as a global (ie power stage) high-end roll off. "It's a simple circuit that uses a 250k pot and a 4.7nf cap between the outputs of the phase inverter. Look up any AC30 schematic, you'll see it." The final front panel control is the Tight switch, which works in both channels to reign in the bottom end response for a quicker, more controlled bass should you want it. The lone feature around the back is a hard-bypassable series effects loop that runs at -10dB - a good match for regular stompbox-type pedals. The loop is driven off a small IC chip rather than being valve-powered. The NT50 uses a pair of EL34 output valves, instead of Vox's more common EL84s. "The EL34s don't move too far from the classic Vox tone - after all the AC50s from the '60s were truly Voxy!" comments Clarke. "One of the main reasons I chose EL34s, and to make it 50 watts, was the fact there is limited space for four power valves… the design evolved and it seemed to fit nicely." Unlike Vox's four-EL84 AC30, the power valves are fixed bias here, but in common with the that old classic, there's no negative feedback, which should mean a more direct, dynamic and visceral response under your fingers. In general design and construction terms, the first thing to note is that the knobs and switches are fully exposed, so do take care not to knock the pots when transporting the amp. They're the good quality, metal-shafted type and secured to the chassis with lock nuts. On the inside, they're connected directly to the main PCB that also houses all the ceramic valve bases and input jack, while the effects loop, speaker outs and footswitch jacks get their own little boards. The chassis is sturdy bent steel, and who can miss that perforated, chromed top case? The NT50 head is partnered by the suitably retro-looking - thanks to its rounded corners - V212NT extension cabinet. Almost fully open-backed and loaded with a pair of Celestion G12H 70th Anniversary drivers, it's made of quality birch ply and designed to be compact enough to lug around, yet with enough room to make it sound considerably bigger than an equivalent 1 x 12 cab. The speakers are rated at 30 watts apiece, with 100dB sensitivity and a 50-ounce ceramic magnet. We view them as a likeable halfway house between the classic Celestion Greenback and the more modern-sounding Vintage 30. The bright channel without the thick mode engaged gives a high-headroom clean tone that barely breaks up, even with maximum gain and powerful pickups. There's plenty of sparkly high end in the Vox tradition, yet as you wind the master, you get a palpable sense of the eye-popping attack you'd associate with a 50-watt 'Plexi'-style Marshall. Some reverb would be lovely here, alas you can only cram so much into that diminutive chassis. Engaging the thick mode is like stepping on a boost, whereupon you can usher in some classic drive; bluesy-sounding with a Strat, more visceral and classic rock- focused with humbuckers. You might miss the EQ controls, but the global Tone Cut knob does a good job of getting the top end response you like. For a moment you wonder if the NT50 might be lacking in volume, but the taper of the master is such that there's always more on tap; where most amps just get more distorted after about six, this one just keeps getting louder. And so it goes with the Girth channel. There's enough gain here to satisfy most styles; a thick, harmonic drive that always stays on the classic rock side rather than modern metal, and with judicious use of the EQ pots and Tone Cut, you can dial in singing, vocal leads that will cut through any mix. The Tight switch is a real boon. The looser setting lets the bottom end off its leash to deliver surprising resonance and trouser flapping thud from the unassuming 2 x 12 - a star performer as it turns out. If you need to keep things more precise - for playing in a busy mix, for example - flicking the tight switch removes much of that extraneous bottom end for sharper, more precise and articulate response. This is a surprising amp. The touch-sensitivity, quick attack and sparkling highs are all classic Vox hallmarks, but they're tempered by the extra headroom and visceral power on tap from that EL34 power section. And don't be afraid to wind that wick up - much of this amp's character and soul is hidden until you get it cooking: it's not one for the bedroom. In stylistic terms it'll cover a great deal of ground - perhaps unsurprisingly - between a more rock-focused AC30 and, dare we say, a heavier-gained Marshall JCM800. 50 watts keeps a relative lid on things, but it's plenty loud enough for a pub and club band, especially with the superb G12Hs: tonally it's a winner.